Load external data from a .csv file into a data frame. Summarize the contents of a data frame. Describe the difference between a factor and a string. Convert between strings and factors. Examine and change date formats. SAFI (Studying African Farmer-Led Irrigation) is a study looking at farming and irrigation methods in Tanzania and Mozambique. The survey data was collected through interviews conducted between November 2016 and June 2017. For this lesson, we will be using a subset of the available data. For information about the full teaching dataset used in other lessons in this workshop, see the dataset description. no_membrs How many members in the household? years_liv How many years have you been living in this village or neighboring village? rooms How many rooms in the main house are used for sleeping? memb_assoc Are you a member of an irrigation association? affect_conflicts Have you been affected by conflicts with other irrigators in the area? liv_count Number of livestock owned. no_meals How many meals do people in your household normally eat in a day? months_lack_food Indicate which months, In the last 12 months have you faced a situation when you did not have enough food to feed the household? You are going load the data in R’s memory using the function read_csv() from the readr package which is part of the tidyverse. So, before we can use the read_csv() function, we need to load the package. Also, if you recall, the missing data is encoded as “NULL” in the dataset. We’ll tell it to the function, so R will automatically convert all the “NULL” entries in the dataset into NA. This statement doesn’t produce any output because, as you might recall, assignments don’t display anything. If we want to check that our data has been loaded, we can see the contents of the data frame by typing its name: interviews. read_csv() assumes that fields are delineated by commas, however, in several countries, the comma is used as a decimal separator and the semicolon (;) is used as a field delineator. If you want to read in this type of files in R, you can use the read_csv2 function. It behaves exactly like read_csv but uses different parameters for the decimal and the field separators. If you are working with another format, they can be both specified by the user. Check out the help for read_csv() by typing ?read_csv to learn more. There is also the read_tsv() for tab-separated data files, and read_delim() allows you to specify more details about the structure of your file. Data frames are the de facto data structure for tabular data, and what we use for statistics and plotting. A data frame can be created by hand, but most commonly they are generated by the functions read_csv() or read_table(); in other words, when importing spreadsheets from your hard drive (or the web). A data frame is the representation of data in the format of a table where the columns are vectors that all have the same length. Because columns are vectors, each column must contain a single type of data (e.g., characters, integers, factors). For example, here is a figure depicting a data frame comprising a numeric, a character, and a logical vector. When using read_csv(), the data frame created is of class tbl_df (called “tibble”). The type of data included in each column is listed in an abbreviated fashion below the column names. For instance, here key_ID is a column of integers (abbreviated <int>), village is a column of characters (<chr>) and the interview_date is a column in the “date and time” format (<dttm>). When calling a tbl_df object (like interviews here), there is already a lot of information about our data frame being displayed such as the number of rows, the number of columns, the names of the columns, and as we just saw the class of data stored in each column. However, there are functions to extract this information from data frames. Here is a non-exhaustive list of some of these functions. Let’s try them out! Note: most of these functions are “generic”, they can be used on other types of objects besides data frames. Our interviews data frame has rows and columns (it has 2 dimensions), if we want to extract some specific data from it, we need to specify the “coordinates” we want from it. Row numbers come first, followed by column numbers. However, note that different ways of specifying these coordinates lead to results with different classes. : is a special function that creates numeric vectors of integers in increasing or decreasing order, test 1:10 and 10:1 for instance. In RStudio, you can use the autocompletion feature to get the full and correct names of the columns. 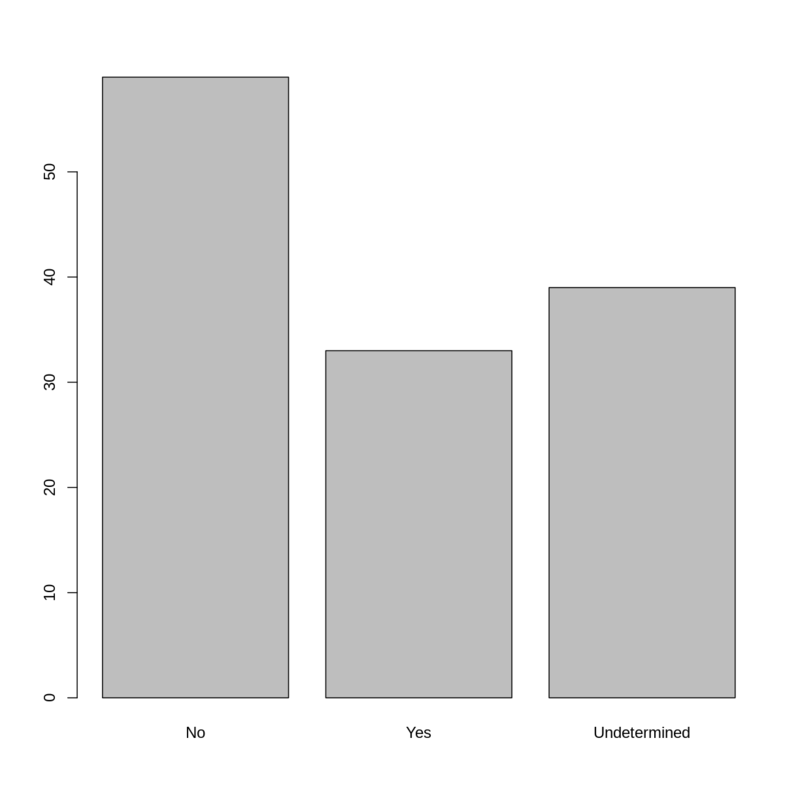 Create a data frame (interviews_100) containing only the data in row 100 of the surveys dataset. Notice how nrow() gave you the number of rows in a data frame? Create a new data frame (interviews_last) from that last row. Use nrow() to extract the row that is in the middle of the data frame. Store the content of this row in an object named interviews_middle. Combine nrow() with the - notation above to reproduce the behavior of head(interviews), keeping just the first through 6th rows of the interviews dataset. R has a special data class, called factor, to deal with categorical data that you may encounter when creating plots or doing statistical analyses. Factors are very useful and actually contribute to making R particularly well suited to working with data. So we are going to spend a little time introducing them. Factors represent categorical data. They are stored as integers associated with labels and they can be ordered or unordered. While factors look (and often behave) like character vectors, they are actually treated as integer vectors by R. So you need to be very careful when treating them as strings. In R’s memory, these factors are represented by integers (1, 2), but are more informative than integers because factors are self describing: "cement", "earth" is more descriptive than 1, and 2. Which one is “earth”? You wouldn’t be able to tell just from the integer data. Factors, on the other hand, have this information built in. It is particularly helpful when there are many levels. It also makes renaming levels easier. Let’s say we made a mistake and need to recode “cement” to “brick”. as.numeric(levels(year_fct))[year_fct]   # The recommended way. ## create a vector from the data frame column "memb_assoc"
Looking at the plot compared to the output of the vector, we can see that n addition to “no”s and “yes”s, there are about some respondents for which the information about whether they were part of an irrigation association hasn’t been recorded, and encoded as missing data. They do not appear on the plot. Let’s encode them differently so they can counted and visualized in our plot. ## Let's recreate the vector from the data frame column "memb_assoc"
## replace the missing data with "undetermined"
Rename the levels of the factor to have the first letter in uppercase: “No”,”Undetermined”, and “Yes”. 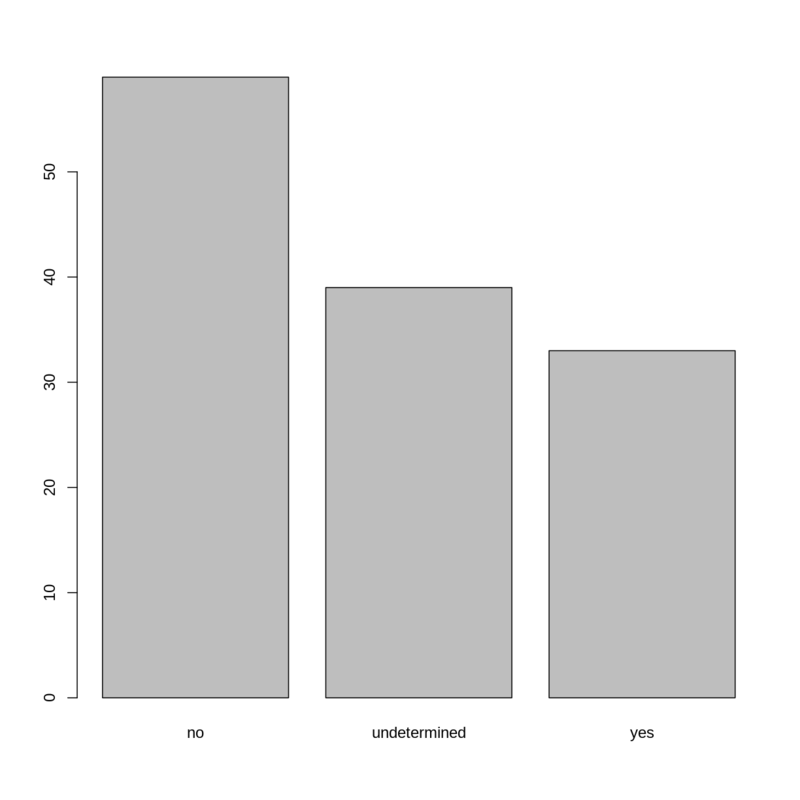 Now that we have renamed the factor level to “Undetermined”, can you recreate the barplot such that “Undetermined” is last (after “Yes”)? One of the most common issues that new (and experienced!) R users have is converting date and time information into a variable that is appropriate and usable during analyses. As a reminder from earlier in this lesson, the best practice for dealing with date data is to ensure that each component of your date is stored as a separate variable. In our dataset, we have a column interview_date which contains information about the year, month, and day that the interview was conducted. Let’s convert those dates into three separate columns. The lubridate function ymd() takes a vector representing year, month, and day, and converts it to a Date vector. Date is a class of data recognized by R as being a date and can be manipulated as such. The argument that the function requires is flexible, but, as a best practice, is a character vector formatted as “YYYY-MM-DD”. Notice the three new columns at the end of our data frame. 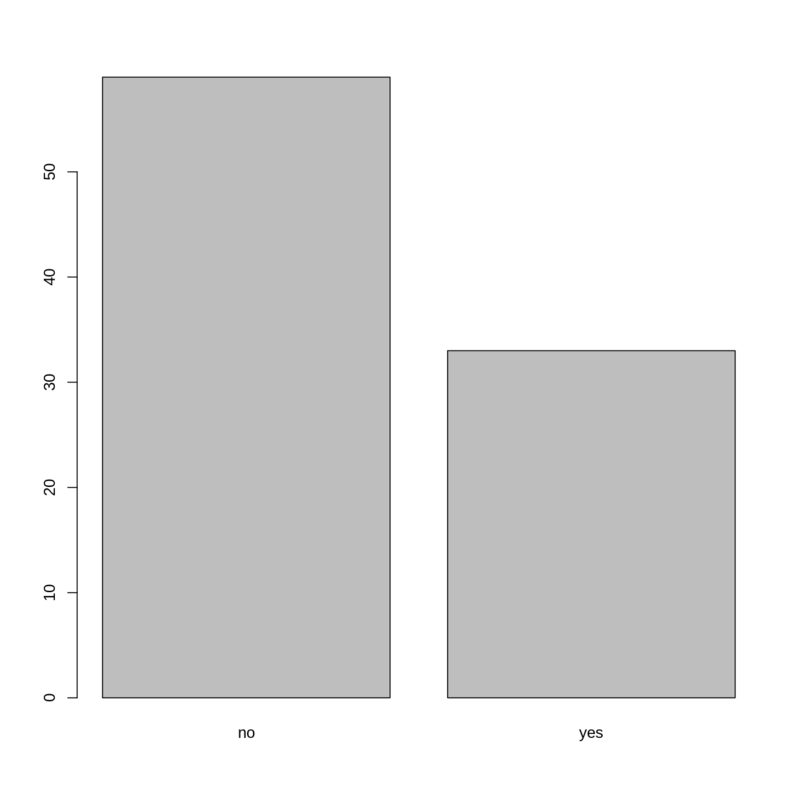 Use factors to represent categorical data in R.